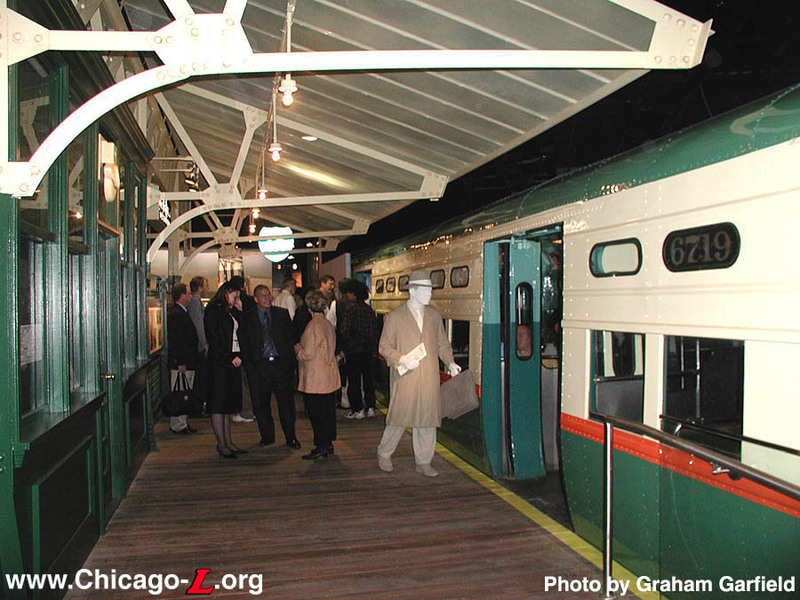 On Saturday, November 22, 2003, a new exhibit documenting the history, equipment and impact of the "L" on transit and Chicago history opened, but this display is unlike any attempted before. 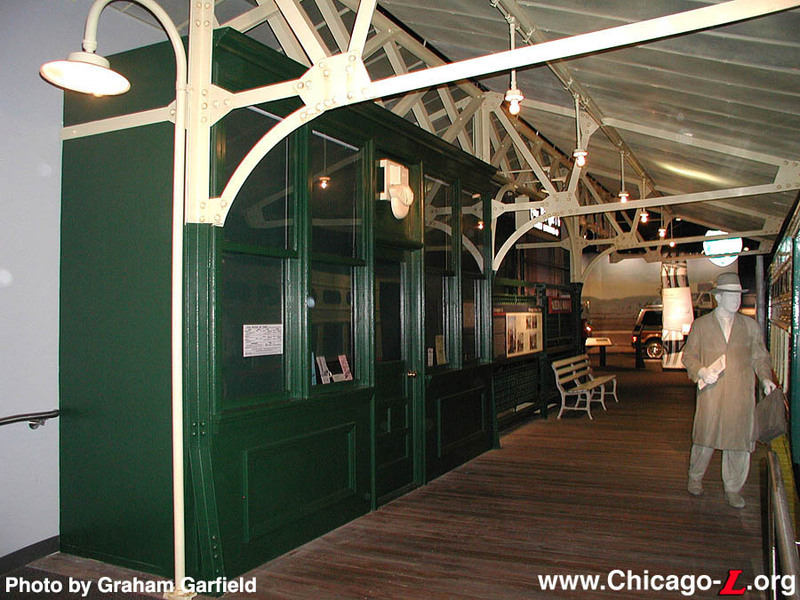 Comprised not of restored cars operating on museum tracks or displays of salvaged artifacts hung on carbarn walls, this exhibit seeks to transport visitors back in time for an immersive experience in the bygone days of Chicago rapid transit. The Smithsonian's National Museum of American History (NMAH) has completely renovated of its transportation hall with an installation of a major new exhibition, "America on the Move." Encompassing nearly 26,000 square feet on the first floor of the museum, the new transportation hall takes visitors on a journey though the history of the United States shaped by transportation. The exhibition uses multimedia technology and historical artifacts to create period settings around times and places where transportation changed American lives and landscapes. Visitors are transported back in time and immersed in the sights, sounds and sensations of transportation in the U.S. from 1876 to the present using over the 300 objects set in elaborate recreations of places around the US. "America on the Move" takes the place of the museum's former exhibitions in the old Road Transportation, Railroad, and Civil Engineering Halls. Organized chronologically, the exhibition has 19 sections with more than a dozen vignettes showcasing the Smithsonian's popular transportation collections in historic settings. Among the historical moments explored are the coming of the railroad to a California town in 1876, the role of the streetcar and the automobile in creating suburbs outside of cities, and the transformation of a U.S. port with the introduction of containerized shipping in the 1960s. As they travel through the show, visitors will be able to see large and impressive objects, including a 92-foot Southern Railway locomotive, the 260-ton 90-foot-long "1401" locomotive, a 1903 Winton, the first car driven across the United States, and an actual piece of the famed Route 66. 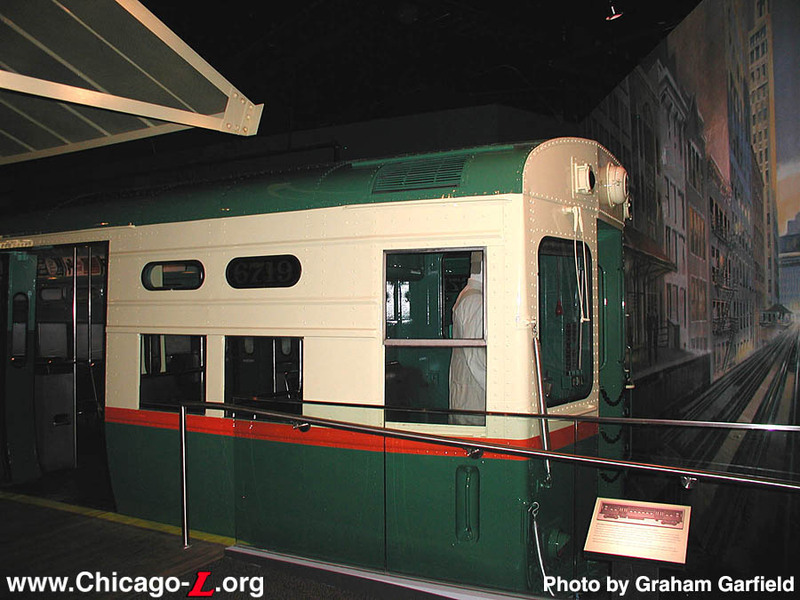 Representing urban transportation in the post-World War II period is Chicago, with elaborate displays on both the "L" and bus transit. Unique among the other displays in the exhibit, the CTA® section fully immerses the visitor in a replicated environment representing the "L" as it appeared on December 15, 1959. 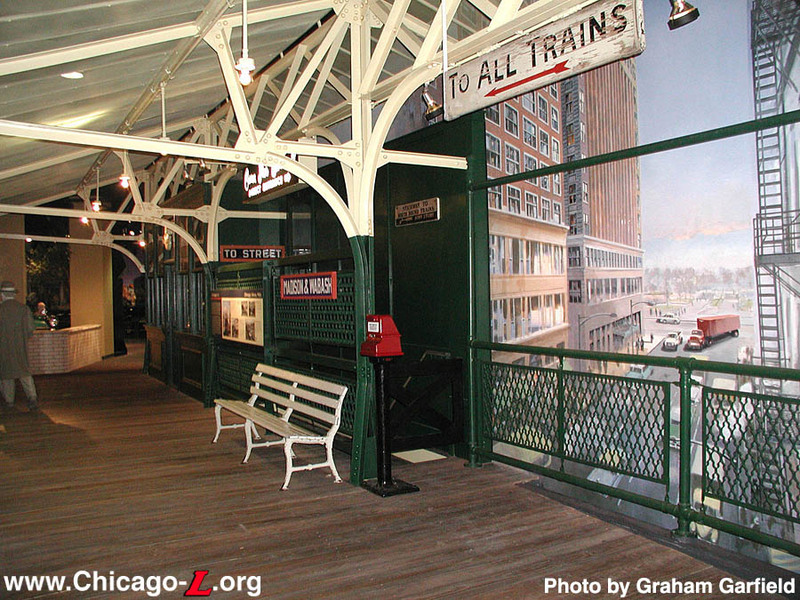 Entering the transit section, visitors walk onto the wooden platform of a replicated Madison/Wabash elevated station, complete with platform-level station house on the left, canopy overhead, and restored 6000-series PCC car 6719 on the right. In the station, people can read brochures and pamphlets in the station agent's window, look at authentic restored and replicated period signage, or read informational displays and labels. An authentic transfer stamp machine stands ready to validate your transfer, while the restored, backlit Carson Pirie Scott sign leads shoppers to the direct entrance to the department store. Murals behind the railings give visitors a vista of Madison Street as it appeared at the time. 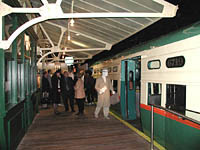 Stepping onto the "L" car, visitors are treated to a car as it appeared going into service that year, with original paint scheme, decals, and even reproduction car cards and advertisements from 1959. In the motorcab is a replicated figure of a motorman, rendered in neutral tones, in uniform with his hand on the cineston controller; on the platform is a businessman rushing to board the train before the doors close. Making one's way to the #2 end of the car, a rear-projection screen covers the rear quarter of the car, sealing it off from just beyond the side doors. Once aboard, visitors can "ride" the car around the Loop through the use of light projections on the windows and special effects that will make the car sway, rattle and screech as in real life. "Passengers" can sit in the car's stuffed seats for a while, if they wish, and watch their fellow "commuters" thanks to the screen that stretches the width of the car behind the #2 end side doors. 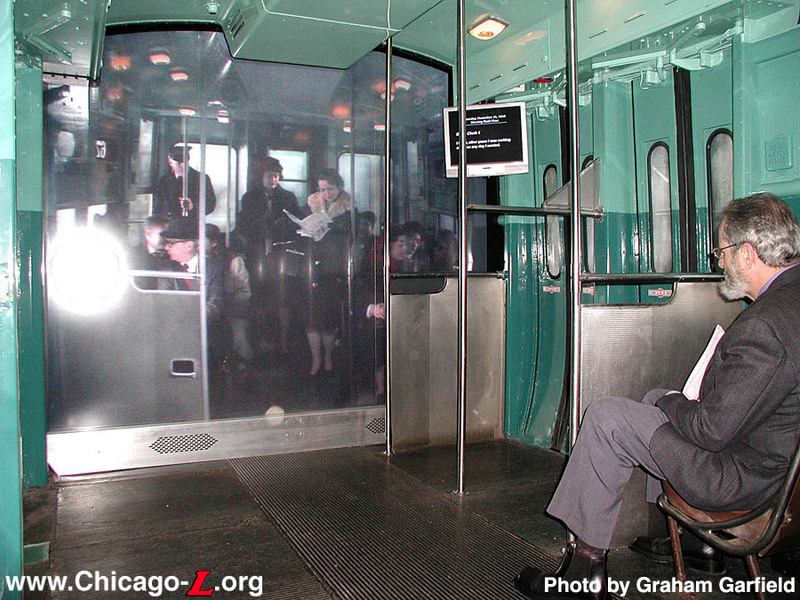 Actors playing 1959-era "L" riders and CTA® personnel were filmed acting out a typical day-in-the-life situation, which is then rear-projected onto the screen in high-definition digital video. Speakers line the floor below the screen and the actors' voices can be heard coming from the appropriate side of the car, except for the announcements from the conductor, which can be heard coming from the PA speakers in the ceiling throughout 6719. Outside the car windows around the actors, one can see the Loop landscape passing by while the lights flicker in synch in the car and in the video as the car crosses gaps in the third rail (actually timed out based on information provided by the CTA®). Leaving the car and Madison/Wabash, visitors can see three station dedication plaques -- two from the State Street Subway (a rarity to have in pristine condition, due to their tendency to break upon removal because of their execution in structural glass) and one from a Congress Line station -- before finding themselves on the "intersection" of Madison and Wabash underneath the elevated structure. On one side the street are the stairs up to the station mezzanine, while in the street a Fageol propane bus on the #20 Madison route waits to pick up "combination riders" (as CTA® publicity once called intermodal passengers). Actually, it's only the front section of an actual bus, with the rest removed for space limitations and represented by a mural behind it. The Loop Elevated structure looms overhead, represented in part with replicated bents and stringers and part by realistic murals, while the opposite side of Wabash Avenue is seen on the wall next to the bus. Informational plaques describe the bus system and other postwar developments in the Chicago transit system, while an interactive display allows visitors to hear the stories of John Smith, one of the CTA's® first African-American bus drivers in narratives recorded during a series of interviews with the retired CTA® operator. Assembly all of these materials and artifacts was a multiyear undertaking for the Smithsonian, led by exhibit curator Bonnie Lilienfeld. Lilienfeld, who is also the museum's curator of ceramics and glass, lived in the Windy City from 1978 to 1987 and attended the University of Chicago, during which time she became interested in the "L" as both transportation and recreation. "I love the 'L'," she told the Chicago Tribune. "I loved taking the Howard line [from Hyde Park] because it was elevated and ran through the South Side. Coming from a small town in western New York as I did, to me it was just like magic being on the train with the noises and just watching the people. I'd just ride downtown and, go around the Loop, get off and walk around and look at the buildings. I didn't even have a driver's license." It was Lilienfeld who helped make Chicago such a large section of the new exhibit. When the museum embarked on the new transportation hall project in 1999, it made detailed plans for many aspects of the exhibition, but had nothing in mind for Chicago except the notion that something about it ought to be included. Upon seeing a vague notion that Chicago might be included, she went to project director Steve Lubar, another University of Chicago grad, who agreed not only to include Chicago in a big way but to make Lilienfeld the curator of that section of the exhibit. Lilienfeld considered several different time periods for Chicago to represent, but finally settled on the 1950s, a time when Chicago was undergoing a tremendous change. "The '50s were a really dynamic period in Chicago," she said. "You had Mayor [Richard J.] Daley coming in, which was a huge deal. You had urban renewal, for good and bad. You had a lot of demographic and social changes going on in the city and suburbs. They were building the expressways. In the 1950s, Chicago pioneered the use of expressway medians for rapid transit trains." Once the time period was established, the next decision was what aspects of the CTA® system to represent. Although replicating part of the Congress Line or one of its stations was an early consideration, Lilienfeld ultimately chose to focus on the Loop Elevated, one of the most famous aspects of the "L". Around the same time, a fortuitous set of circumstances made a period-appropriate "L" car available for purchase. The CTA® still had a few of its PCC cars in storage on the system awaiting being scrapped. Several had been purchased by railfan David Harrison in hopes of restoring them and keeping them on the CTA® system, but after an agreement between the CTA® and Harrison could not be reached for a way to operate the cars on the "L" he sold them back to the Authority, who was now looking for a way to dispose of them. When the Smithsonian learned of this, they purchased one car, unit 6719, in December 1999 for scrap value with the intent of restoring and using it in the new "America on the Move" exhibition. Although a PCC single unit, car 33, was also available for sale, the Smithsonian chose to take 6719 because of its more typical interior layout and the presence of the dual conductor's positions. Unfortunately, this meant breaking a married-pair and leaving its mate 6720 essentially useless and undesirable for another museum to buy. Lilienfeld desired to buy car 6720 as well, but while price was right the museum had no place for it in the exhibit or in storage. The car has since been scrapped. 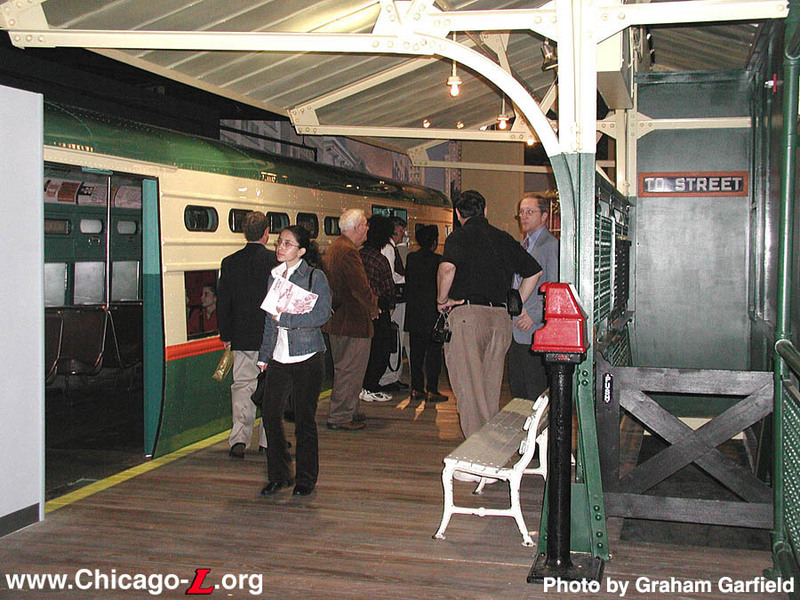 After the Smithsonian purchased car 6719 from the CTA®, it was moved from Skokie Shops and stored at the National Park Service's Steamtown National Historic Site in Scranton, Pennsylvania, while the Museum went about the task of deciding how best to use the car in the exhibition. Meanwhile, the rest of the exhibit needed to be planned. After the decision to represent Chicago using the Loop Elevated, Madison/Wabash station was chosen as the location to replicate. Initially, with the City of Chicago's plan to eventually rehabilitate the stations on the Wabash side of the Loop (possibly resulting in Madison's demolition), it was hoped to perhaps actually remove parts of the station structure, restore them, and install them in the exhibit. When this proved unfeasible, it was instead decided to replicate the station, including part of the Outer Loop platform and platform-side facade of the track-level station house. Plans for 6719's place in the exhibit also developed. Some at the Smithsonian were opposed to bringing the "L" car into the exhibition because it is 48 feet long. It was decided to put the train in the "station" that was going to be erected, allowing visitors to stroll on the station platform, then enter the car as it was "berthed" at the station. There was talk of cutting it in half, an act Lilienfeld opposed, seeing it as desecrating an important artifact. "I wore them down [about taking the car]," Lilienfeld said, "and then I wore them down about cutting the car in half." She did have to agree to removing the car's wheels and undercar equipment to accommodate the level of the replicated platform. If the decision of when and where in Chicago to represent was a easy part, the task of making an era nearly a half century bygone come back to life was going to be the tricky part. Before getting very far into the project, a lot a difficult questions about details both minute and major arose, many of which were tricky to answer. Some involved what the Madison station looked like in 1959, what colors the station was painted, and what types of materials were in use at the time. Restoring the car brought its own set of challenges, including such details as what color the window sills ought to be and how to precisely mix the right exterior and interior paint colors. A diverse group of transit experts and historians -- including author and historian Bruce Moffat; Bill Wulfert and others from the Illinois Railway Museum; CTA® Vice President of Planning and Development Michael Shiffer, Chief Rail Equipment Engineer Walter Keevil, and personnel from the Graphics Department and other groups; the Krambles-Peterson Archives; and this web site and its administrator, Graham Garfield; among others -- assisted Lilienfeld with research for the project, digging through files and archives to uncover pertinent materials, documents and photographs and answering a myriad of questions. In 2002, transit car manufacturer Alstom Transport in Hornell, New York, offered to donate the work necessary to restore 6719 to its original paint scheme inside and out. The car was also modified to make it ADA accessible to Museum visitors; the wheels, trucks, and other undercarriage materials were removed to lower the car, making entry easier for wheelchair-bound visitors. After restoration was complete, car 6719 was brought to the Museum on a trailer by Silk Road Transport, a specialized transit hauler. At about 3am on January 7, 2003, car 6719 began its final trip from the Washington DC city limits to its place in history at the Smithsonian National Museum of American History. Meanwhile, another part of the exhibit was bringing its own difficulties. 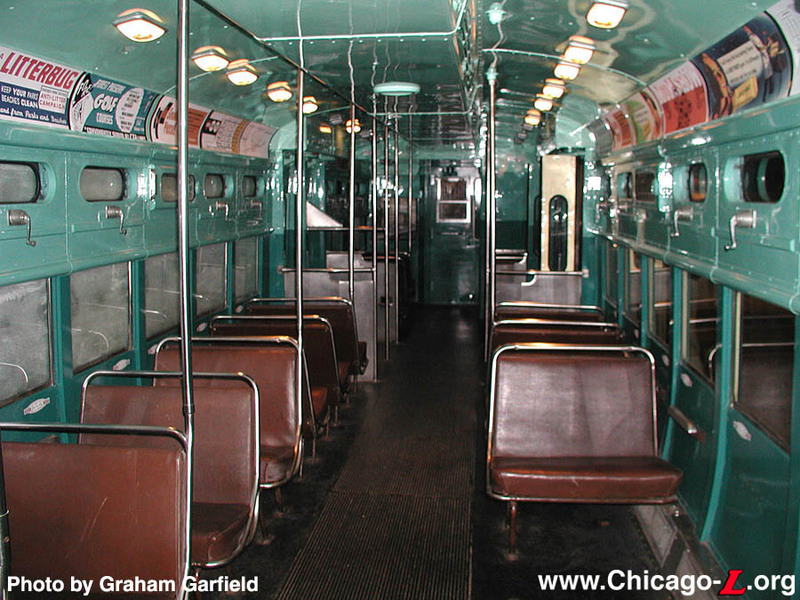 It was also intended to include a bus in the recreation of 1959 Chicago, representing the postwar surface transportation system. The trouble is, there were very few period-appropriate buses found by museum researchers. The museum intended to only use half of whatever bus they found due to space constraints, and those appropriate buses they did find belonged to groups or individuals that were unwilling to sell their vintage vehicles to be cut up. The situation was looking dire until a suitable bus was located by museum researchers in a Nebraska scrap yard. The yard had several old derelict buses, including a Fageol "Old Look" Twin Coach propane bus, model 45SP. Made in 1950, this exact type of bus was operated by the CTA®, one of the largest operators of propane buses. Fageol, which later became Flxible, was one of the few firms to produce liquefied petroleum gas (propane) buses in the 1950s. 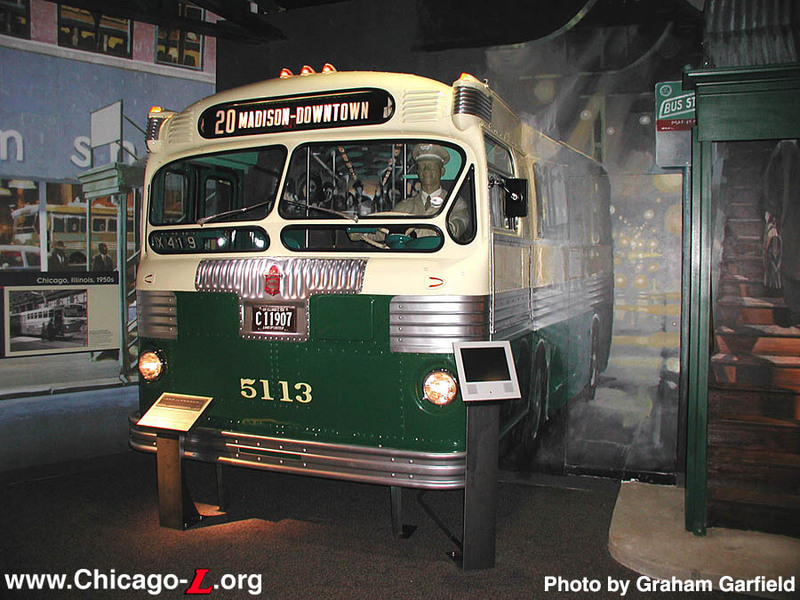 Although the particular bus that was chosen was not from Chicago -- it was originally Omaha Transit Company bus #1210 -- it was the exact model that the CTA® used. 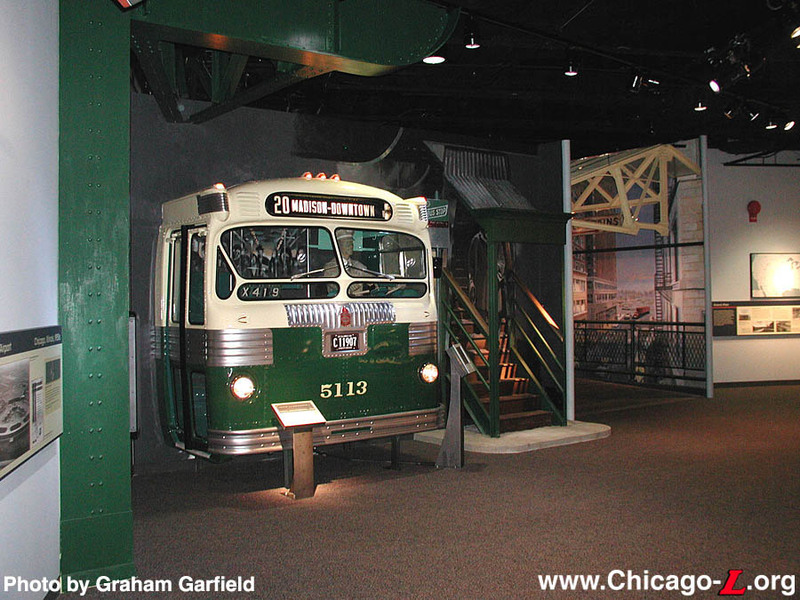 So, repainted in Chicago colors as bus #5113 and given a CTA® destination sign, the bus would make a fine stand-in for the type of vehicle the museum was looking for. The Smithsonian purchased #1210 in February 2003 and Werner Enterprises, of Omaha, Nebraska, donated the work to cut and modify the bus to replicate a CTA® vehicle. With car 6719 moved into place, the rest of the exhibit could be built around it. The facade, canopy, and railing sections of the station were fabricated off-site and brought in to be assembled. 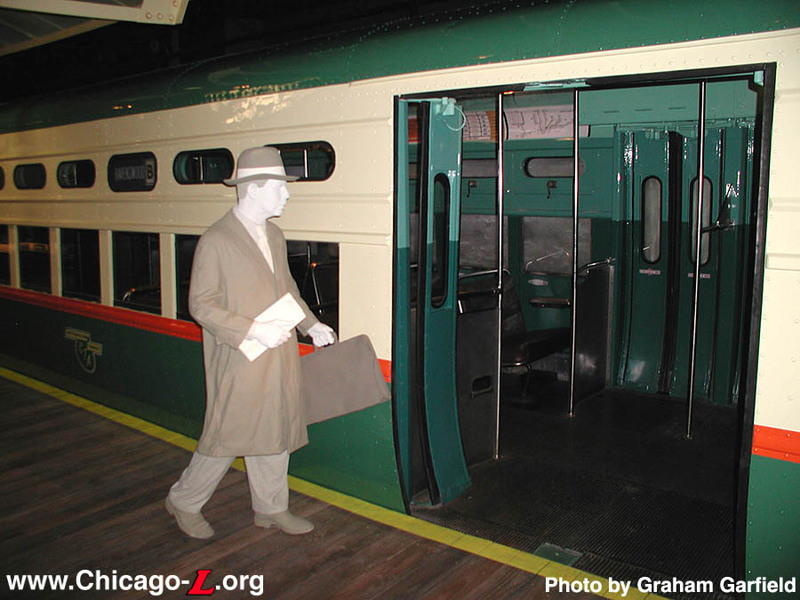 Life-size polyurethane figures executed in neutral gray tones which represent commuters, the "L" motorman, and the bus driver (as well as many other persons around the exhibit) were created. Vintage signage that was salvaged from the "L" system was cleaned and restored for exhibit, while other signs and vintage car cards from 6719 were replicated. The footage of actors representing commuters and the conductor in 1959 was shot on 6917 in spring 2003, with passengers talking about period subjects, reading vintage newspapers, carrying vintage Marshall Field shopping bags, and getting on and off the train at various stops while the conductor called out stops and worked the doors. Following the filming, the screen was installed over the spot where the scene takes place and the complex audiovisual system was built into the car. Through summer and autumn 2003, the rest of the construction was completed and the finishes were applied. Murals were painted around the station and the bus, depicting the backgrounds and environment of the 1959 urban streetscape. The complex system of audio programs, digital video, lights, "shakers" and other technology that brings that train car ride to life were installed and fine-tuned, all controlled by a complex computer system. Finally, in November 2003, the exhibit was ready for visitors. Initial support for the exhibition came through a $3 million congressional appropriation made in 1997. The funds came to the museum through the U.S. Department of Transportation. General Motors was the principal sponsor with $10 million, State Farm Companies Foundation provided a $3 million gift and the History Channel's $3 million contribution included production of several of the extensive video elements in the show. AAA, the nation's largest motoring and leisure travel organization, contributed $2.3 million and ExxonMobil Foundation supported the show with $2 million. Both groups are including national marketing initiatives as part of their donation. There are five $1 million donors to the exhibition: the American Public Transportation Association (APTA); the American Road and Transportation Builders Association (ARTBA); the Association of American Railroads (AAR); the National Asphalt Pavement Association (NAPA) and the UPS Foundation. 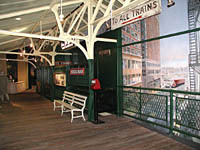 The funding covered the complete renovation of the museum's Hall of Transportation; the production and installation of the "America on the Move" exhibition with multimedia elements including videos and "sound scapes" in period settings; a national education program; public programs; a Web site; promotional activities; and maintenance for the show. The cost of the hall renovation and the exhibition together is approximately $22 million. The congressional funds enabled the museum to develop the exhibition script and design before any private sector fundraising began. 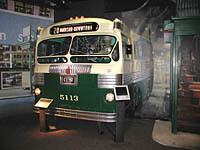 Most of the museum's transportation exhibitions have not been significantly remodeled since the museum opened in 1964. The Smithsonian's National Museum of American History is located at 14th Street and Constitution Avenue NW in Washington DC, and is open daily, from 10am to 5:30pm. The closest Washington Metro subway station are Smithsonian to the south and Federal Triangle to the north. For more information, visit the museum's Web site at http://americanhistory.si.edu or call (202) 357-2700, 357-1729 (TTY), or 633-9126 (Spanish). America on the Move: The Smithsonian National Museum of American History's official web site for the exhibition. The site features material from the exhibition, plus behind-the-scenes accounts of the making of the exhibition and more stories from curators about our objects and their place in American history.